Leaders Livingston may have been idle – their match against Albion Rovers was postponed due to a frozen pitch – but they enjoyed a profitable day as both of their closest challengers dropped points. 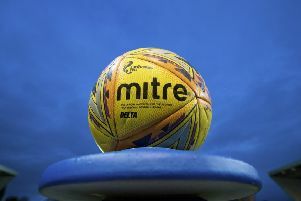 Alloa Athletic dominated Peterhead at the Indodrill Stadium but lost 1-0 against opponents who had to play for the final 14 minutes short-handed after goalscorer Leighton McIntosh was sent off. McIntosh picked up two quick yellow cards to blot his copybook after scoring the only goal of the game four minutes into the second half. He started and finished on the bench after replacing top scorer Rory McAllister late in the first half. Airdrieonians had to rely on a last-minute goal from Jack Leitch to earn a 2-2 draw at home to East Fife and deny their opponents a sixth successive win. Andy Ryan put them in front after 26 minutes when he slotted home Adam Brown’s pass but East Fife equalised in the final minute of the first half when a Mark Lamont corner picked out Jason Kerr at the back post and he headed home. East Fife moved in front with 15 minutes left when Ross Brown headed past Rohan Ferguson. Leitch then made his belated contribution, equalising at the front post. Stenhousemuir moved off the bottom of the table with a 1-0 win over Stranraer at Ochilview. Stenhousemuir would have won more handsomely but for some inspired goalkeeping from Cameron Belford, who was finally beaten on 68 minutes when when Kieran Miller lashed the ball over him. Brechin City v Queen’s Park also fell victim to the cold weather.